Overview: Come see the beautiful fall colors in the mountains of North Georgia! 20+ miles of untouched single track, 20+ water falls (including the 120 ft Holcomb Creek falls and 80 ft Ammon Falls), 2 summits of Rabun Bald (the 2nd highest point in Ga at over 4,700 ft! ), 2 x 360 degree views of mountains in 3 different states, 15 small bridge crossings, a couple of water crossings (one of which is thigh deep), and just more fun and scenic beauty that you could ask for. Oh and did we mention that it’s got over 14,000 ft of elevation change? This gem of a 50k starts and finishes in Sky Valley, Georgia. Sky Valley is the highest city in Georgia at 3,100 ft. We have also named Sky Valley as the Mountain Running capital of Georgia for its plethora of trails within walking distance from the city. It was home to the Sky Valley Ski Resort which has since closed. This time of year brings the fall colors out that really pop off the reflection of the lakes. If this isn’t the most scenic run you have done then you never picked your head up during the race! QUALIFIER FOR THE GEORGIA DEATH RACE! 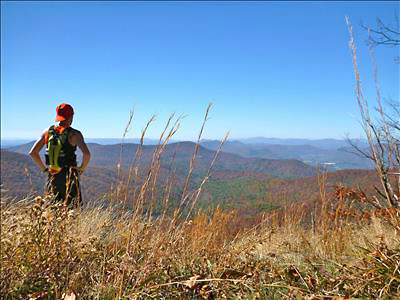 The Sky to Summit 25k is a run that starts and finishes in Sky Valley, Georgia. Runners will run to the summit of Rabun Bald and back. About 4000 ft of climbing total and the same descent. The race passes by some beautiful private lakes. While most people will be hiking most of the up there will still be folks who run the entire thing. Sprinters and back of the packers welcome! COME SEE RABUN BALD, THE MOST BEAUTIFUL VIEW IN GEORGIA! TO BE GUARANTEED A SHIRT YOU MUST SIGN UP BY OCTOBER 15th. If not you will most likely not get a shirt! Anytime before the race starts, runners are welcome to drop down to the lower event, but you may not go from the 25k to the 50k. No refunds transfers or deferments… no exceptions. Sorry we do not mail shirts.